Today was a relaxing morning hike mostly downhill into Damascus. 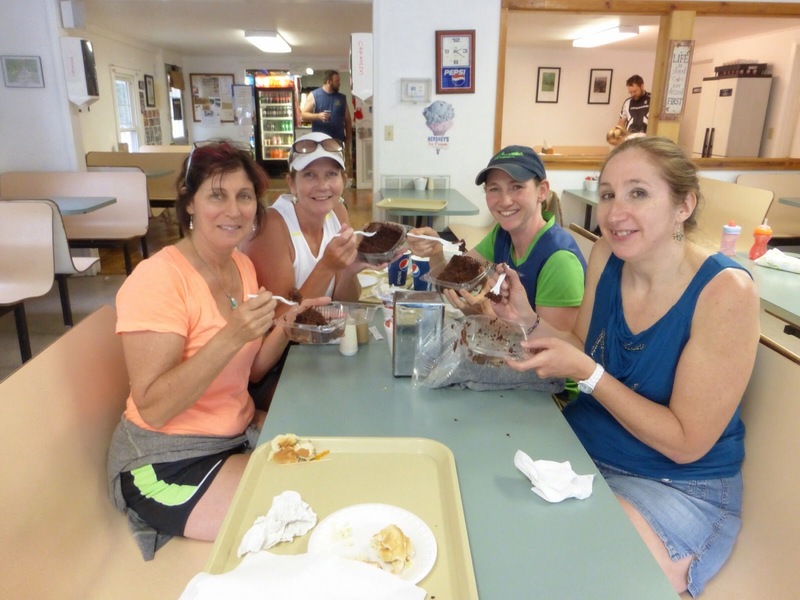 Known as “The Friendliest Town on the Trail,” it seems like a real turning point. 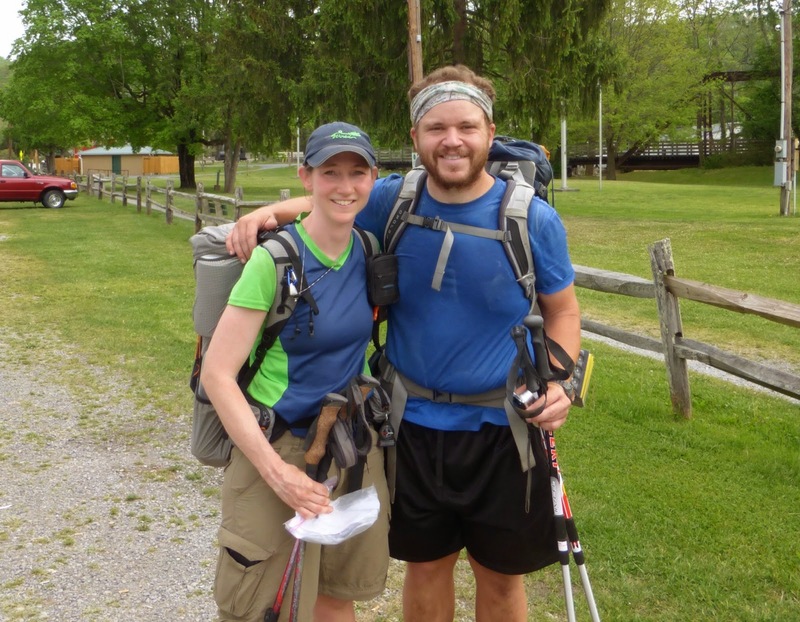 It is said that the first 500mi and the last 500mi are the most difficult on the trail, so it will be getting easier very soon. Many hikers know this and tend to kick up the daily mileage after Damascus. It is a very small town with the main drag just a mile and a half long, but it is where the annual AT Trail Days takes place. Trail Days is next weekend here and many hikers aim to hit it or hitch to the event. There is a parade, vendors, hiker events, booths, and just basically a very large party. Someone today said that 25,000 people come through over the three days of Trail Days. Many of you are wondering if I will be there and I will not. It really isn’t my thing to be in such a crowd and it really is quite a party from what I hear. So sorry to disappoint, but I will not be going to Trail Days. Back to today…I got going by 6:45am and after an hour Rambler hiked up behind me. I overlapped with him a bit yesterday and he had camped about a mile back from me last night. 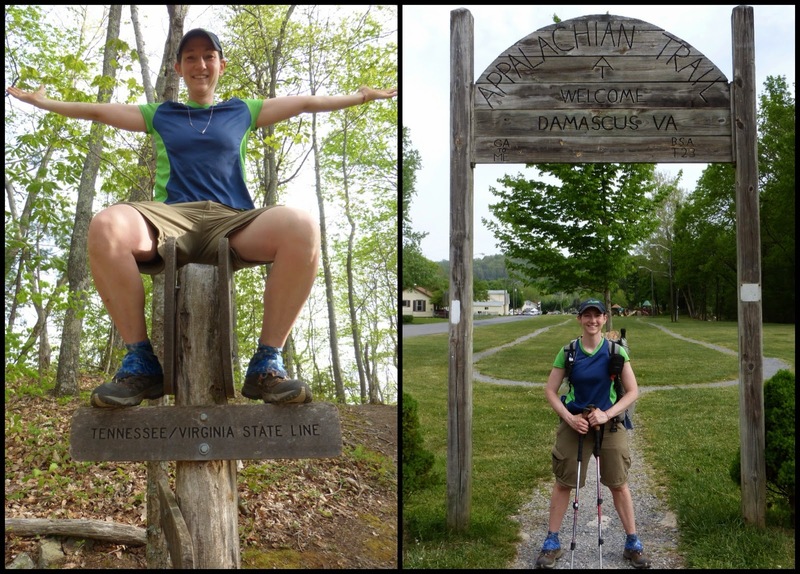 We were both very happy to have someone else with us to take photos of the Tennessee/Virginia border and the arch for Damascus. I may see Rambler in a couple days as he hoped to hike out tonight with Shane and Simba. He’s getting off soon to attend a wedding next weekend and wants to get some miles in this week before he goes. 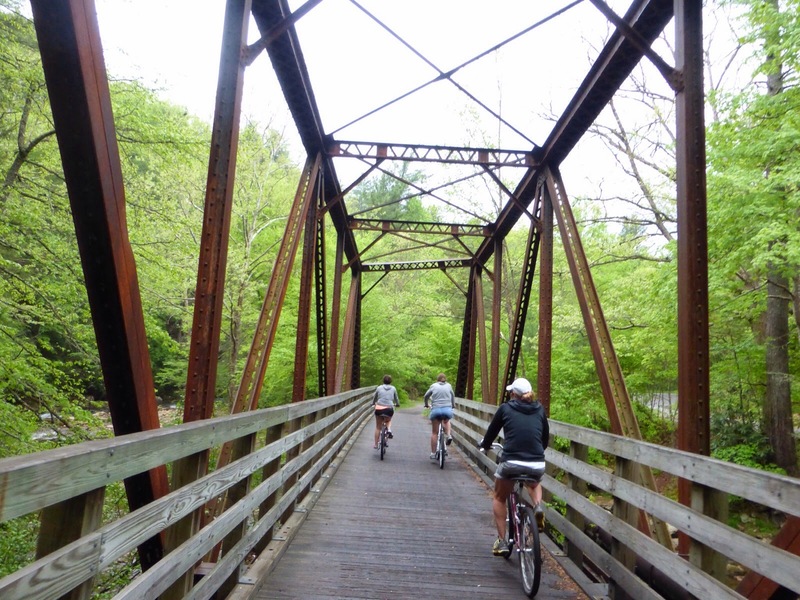 I’ve been hearing a lot about a bike trail called the Virginia Creeper trail that people recommend. 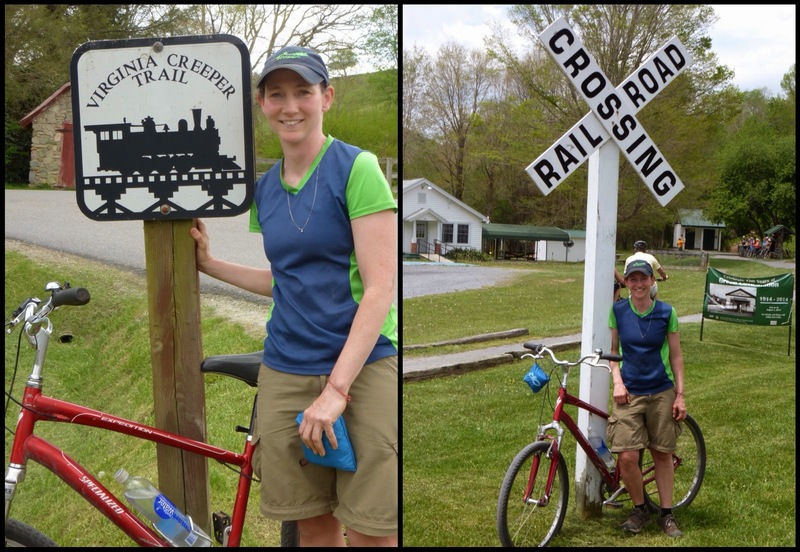 It is a 34mi, nationally known, bike ride that used to be an old railway (used until 1977) and was called the “creeper” for how slowly it moved through the mountains. 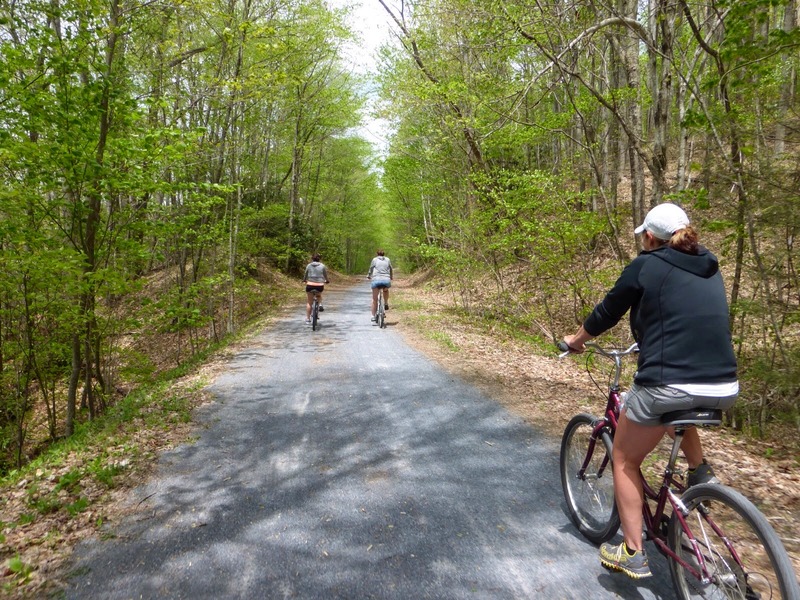 Well, the most popular stretch of the trail is a 17mi portion in which you can rent a bike in Damascus and get shuttled to one end and ride (or coast) 17mi downhill along the scenic trail. Well, since so many told me I must do it and I was getting to town so early, I decided to do it! I had enough time to get to town, hit the library for an hour to use the computer, eat lunch, and then catch the noon shuttle. I was in a van with three women (Michelle, Arlene, and Denise) who were friends so we all rode together and it was enjoyable. 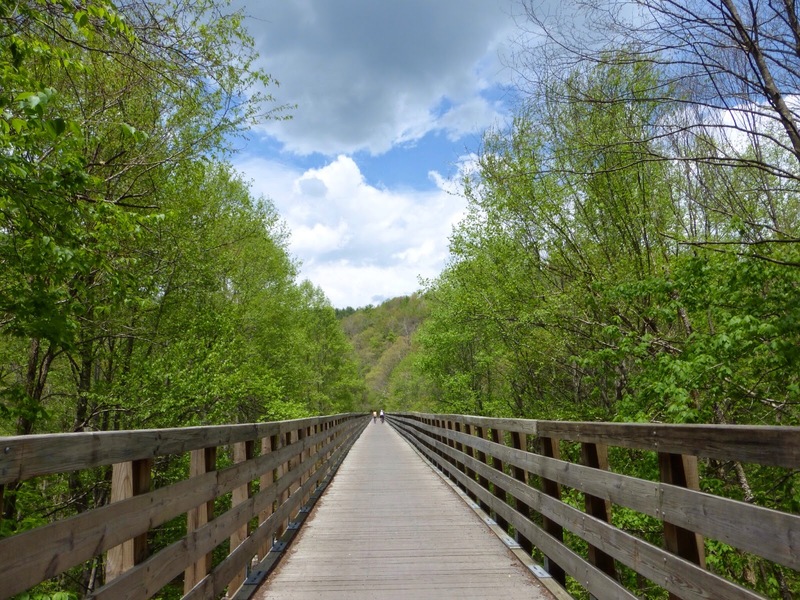 The AT overlaps the Creeper Trail for 1/2mi, but there is also a way for hikers to cut three miles off the AT and avoid a mountain by doing more of the Creeper Trail. I saw lots of hikers doing that today. It’s each person’s choice, but I won’t be doing that tomorrow. The Creeper Trail was nice. Most of it looked like this with trees lining both sides. The trail follows the Whitetop Laurel River. We jumped off at one point and there was a nice spot for a photo op. There were also over 30 trestles/bridges in the section we rode as the river wove from one side of the trail to the other. Notice the gathering clouds. There was a 50% chance of rain and isolated thunderstorms in the afternoon today. We were fortunate to only get light rain for a bit here and there. It was a relaxing ride and I enjoyed it. Would I recommend it to other hikers? Probably not. 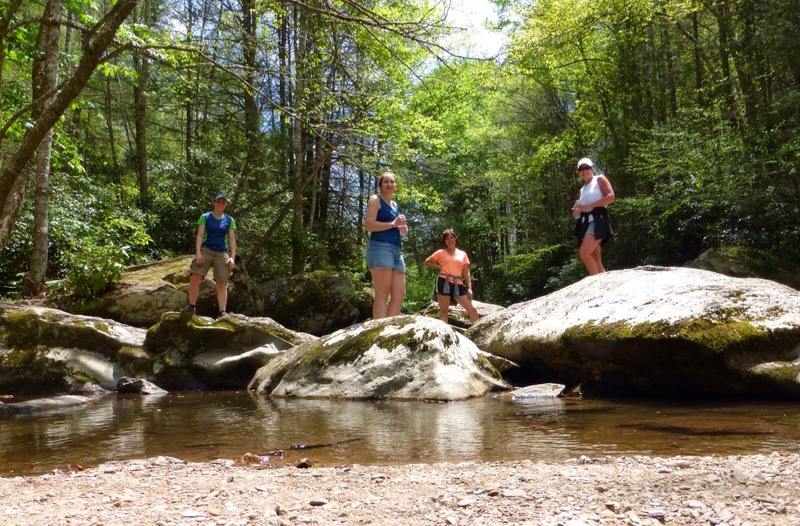 It is nothing different than what we’ve been seeing and hikers will get enough of an understanding of it by seeing it in Damascus and the portion that overlaps the AT. Do I recommend it to others not hiking and just looking for something fun to do? YES! I can imagine in the fall that it would be even better too! Damascus seems to have more hostels than stores so I wasn’t sure which one to pick. I chose the one that seems to have the best accommodations, the Hiker Inn. I chose correctly! They have a separate small bunkhouse with two bunk beds and an individual room. Then they have the main house where individual rooms can be checked out with a communal kitchen, living room, and bathroom. It was super quaint and quiet. The owners, Lee and Paul were really nice and even do your laundry for you. They even let me use their laptop! 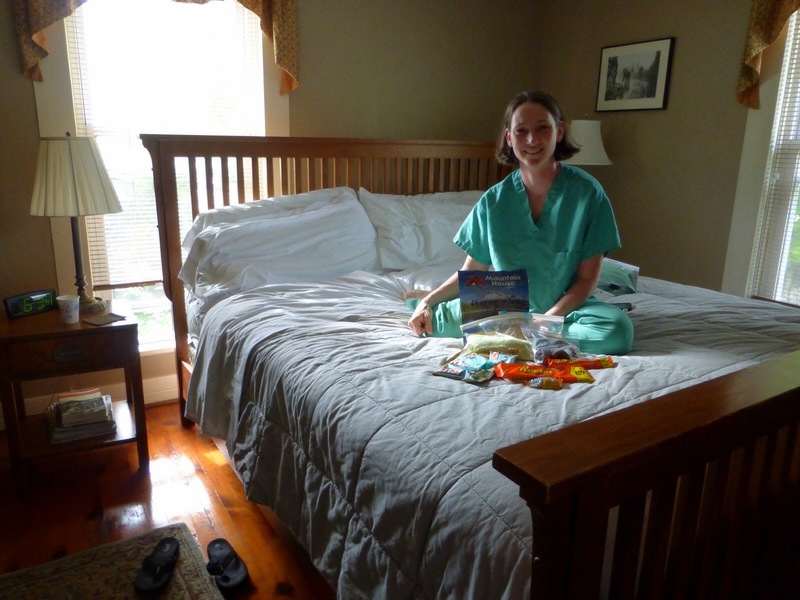 Here I am with my super large bed and in my scrubs they give hikers to wear while they do your laundry. I haven’t been featuring my resupplies as much as I would like and I want to make sure to thank Corinna, Glenn, Harvey, Gail, Dennis, Malto, Michael, and Jenny. I also got to use my Subway gift cards again today for those of you that sent those! THANK YOU everyone!! !